I sometimes feel so overwhelmed by the amount of awesome resources and blog posts that I want to write about on the blog that I don't know how to begin writing about them. In order to help me just get started, I've decided to make a weekly series called MaryAnn's Favorites in which I will share one favorite blog/blog post and one favorite resource. If you're anything like me, your classroom is a heavier on the procedural side than it is on the conceptual and application side. When I search for more conceptual and application tasks, my first go-to is Robert Kaplinsky's Search Engine. Speaking of procedural fluency, playing a good game is a great way to get more student participation. Here are some of my favorite posts about playing games in math class. Most of these I haven't tried, but are on my to-do list as I look for ways to spice up ways that I do practice in my classroom. 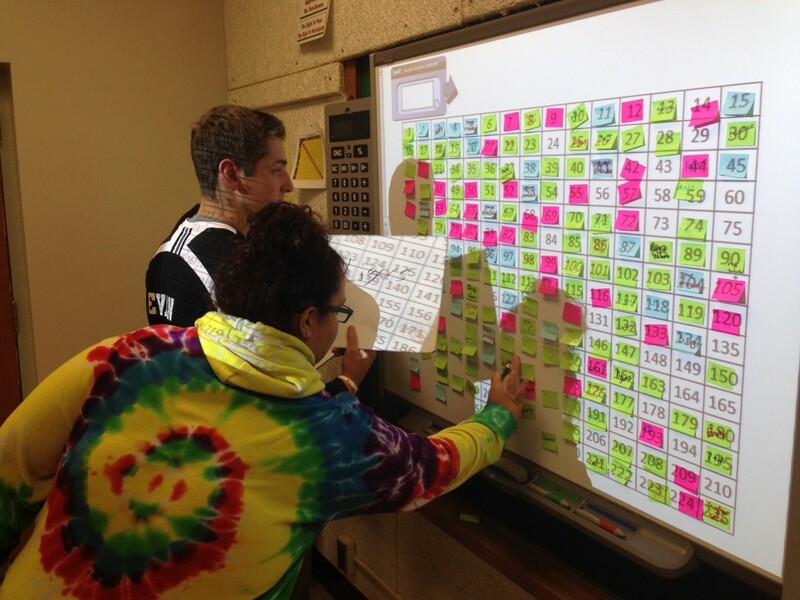 When students get a problem right, they get to put a sticky note on a number chart. At the end of class, a random number generator is used to select a number and a prize goes to the student with the winning number. Grudge: The goal is to be the last person with an X remaining. When students get a problem right, they get to erase some else's X. Leave a comment on it. Share about the blog post you read in a comment on this post. Would you like a reminder for when the Week 2 activity gets posted? You can sign up through email, RSS, Twitter, or Facebook in the right sidebar of this page. Welcome to Week 1 of our MTBoS Orientation! Each week we’ll give you an activity to complete, and detailed instructions on how to do it. In addition to instructions, we’ll also weave in further ways to pursue the activity. Two things we’re aiming for are helping you to connect to quality resources that you’ll find helpful in your classroom, and helping you to connect with other teachers online that you ”click” with. You’ll find ways to push out in both these directions. Everyone’s different—how much prior experience they have online, what their classroom looks like, the areas they hope to grow in, and their personal tastes. We hope you’ll find experiences online that speak to you, and that we can help. All right, reading a blog post. Let’s look at a few places online where you can find a blog post to read. a) On the MathTwitterBlogosphere Weebly site, you’ll find some lists of teachers who blog about different age groups and courses, as well as by special interests. They’re a great place to find some blogs to begin reading. You can also check out the site’s page of A Few Good Blog Posts. b) Maybe there’s a specific topic you’d like to read about, like quadratics or division or similar triangles. Then you can head over to the MTBoS Search Engine and type that term in. Scroll through the results, pick a post and read it. Not sure what to search for? Random Post button! c) Maybe you’d like to read a post by someone with a particular profile—like someone who’s a math coach, or who’s interested in flipped classrooms, or who lives in your state/region/province. Then head over to new MTBoS Directory and poke around for someone. Take a look at their blog and read a post. And maybe while you’re at the directory, you’ll add yourself to it! d) For each of the past couple of years, Geoff Krall has compiled and curated a Math Blogging Retrospectus. Community members submit some of their favorite posts of the year—it’s a great place to find some great posts to read! If you find a post you like, definitely go and check out the author’s blog. e) If you have some spare time (spring break anyone? ), get lost down the rabbit hole of blog rolls. Many bloggers keep a list of the blogs they enjoy reading in a list on the side of their blog. One of the best ways of finding new blog posts and bloggers is to springboard from blogrolls or other mentions of blogs by bloggers whose work you enjoy. f) Maybe you already have a blog that you enjoy reading, but there are old posts that you’ve never gotten around to reading. You could take this as a chance to do a deep dive into their archive. Or if you’re on Twitter, maybe there’s someone there whose tweets you enjoy, but you’ve never read their blog. Here’s your chance to see what they can do with more than 140 characters! When you visit a blog, it’s usually a whole page of individual blog posts. In order to comment, you’ll need to be on the page of a specific post, which you can get to by clicking on the title of that blog post. When you scroll down to the bottom of a post, there will be a prompt that says something like “leave a comment” or “leave a reply.” It will ask you for some information. It’s your call if you want to use your real name or come up with a fun pseudonym. Listing your website is optional, don’t feel bad about skipping it. And don’t worry, your email address will not be published with your comment. When you comment on a blog post, you can write a question to the author, share a related experience or a resource you like, or just express your appreciation to the author. Maybe the author or another commenter will respond to your comment. You can always return to the blog post at a later time in order to check. If you’d like, you can receive a notification when additional comments on a post are added. There should be a checkbox underneath the comment box giving you the option to “check here for notification of follow up comments.” It’s definitely worth giving it a try! You might not see your comment show up on a post right away. Don’t worry: often bloggers moderate the comments on their blog, which means they approve comments before they show up on posts. It can sometimes be tricky to “log in” in order to post a comment. Depending on the platform the blog author uses, you might need to have an account of some kind in order to comment. If you’re not careful, you might hit “back” on your browser, and your comment might get deleted. As a precaution, sometimes you might choose to compose a comment that’s on the long side in another document, and then cut and paste it to the comment box. Don’t just comment on the blog you read! Once you’ve read a post, come back here to this UCTM blog post and this Exploring the Math Twitter Blogosphere post and comment on it as well, down below. (The same process applies.) With your comment, you’ll be sharing what you find with your fellow MTBoS explorers. In the comment, include the link to the blog—just copy and paste it—and let us know what you liked about it. Have a look around to see if any of the blog posts shared by the other commenters are compelling to you, and maybe go check some out. That’s another great way to find new blogs—recommendations from fellow travelers. You might even go for extra credit and read and respond to several blog posts! Have a great week finding some blog posts that inspire and engaged you. We’ll see you next week (4/25) to get you started on Twitter! "The Math Twitter Blogosphere (a tongue twister we fondly shorten to “MTBoS”) is an informal network of math teachers who have found community together on the internet through Twitter and blogs. Over time, this diverse group has grown in number and in scope of activities. We’ve built resources, curricula, websites, and co-authored a book. We run online workshop sessions, problem-solving groups, and a weekly “department meeting” via webinar. Our online connections have even spilled over into “real life”—we have an annual conference called Twitter Math Camp. We are passionate math teachers who take pride in freely sharing our best math teaching ideas. Starting April 18, we will be leading all interested parties (and party-people) on an exploration of the MTBoS community. By joining us for the month-long adventure, you can meet fellow teachers who use the internet to grow professionally. You can learn how to carve out your own little part of the internet. You can peruse some of the many resources made and shared by the MTBoS. You can even get started with a Twitter account or blog reader of your own! On four consecutive Saturdays—April 18, April 25, May 2, and May 9—a “mission” will be posted to this website. Each one will help you to get started in an aspect of the MTBoS community. You’ll be able to mingle with other participants in the comments to the posts on this website, as well as on other sites and on Twitter. We promise that you’ll find success with your forays into the MTBoS—no matter how unfamiliar you may be with social media—and that you’ll have lots of fun along the way." The Utah Council of Teachers of Mathematics is seeking great presenters for its 2015 conference on November 6th & 7th. Presenters lead a 45 minute demonstration, discussion, or research session. All individuals in Utah who work to make mathematics more meaningful for students should apply to present. Classroom teachers are especially encouraged to present lesson plans and strategies they have developed to enhance mathematics instruction. The registration fee is waived for all presenters. Submit your proposal here. Following your proposal submission, you will hear from a board member within three days. If for some reason you do not, please notify Renae Seegmiller at renae.seegmiller@gmail.com. If you are planning to present for the first time and would like more detailed information please contact Renae Seegmiller at renae.seegmiller@gmail.com. This spring and summer, USOE and UCTM are collaborating to present a professional development centered around the book Principles to Actions: Ensuring Mathematical Success for All. Participants can earn 2.0 USOE credits by participating in the course. The course incorporates 3 online sessions (at your pace between March and June), 2 Days Face-to-face (summer, choose the location that works for you), 2 online sessions (at your pace between Summer and Nov 6), and a self-selected capstone project (Due Nov 6). As a final culminating experience, Steve Leinwand will be featured as the keynote speaker at the UCTM Conference on November 6th-7th. Steve Leinwand was the writing committee chair for NCTM's publication Principles to Actions. "This website was inspired by the MTBOS with special thanks to Christopher Danielson and his Building a Better Shapes Book. This is Which One Doesn't Belong?, a website dedicated to providing thought-provoking puzzles for math teachers and students alike.